New listingNordic Studio Pottery Wall Candle Sconce, Huittinen Finland, Signed. Here is aunique studio pottery candle wall sconce. This studio pottery item was made inHuittinen, Finland and is signed as the back as such. It is in an excellent, almost new condition. It has a hole to easily hang on a wall. New listingART POTTERY. STYLISED SCANDINAVIAN STUDIO POTTERY TILE SIGNED 20TH C.
Beautiful, stylish glazed Pair Of Vintage Signed Ceramic / Pottery Decorated Wall Plates. Lovely raised designs and bright colours. The backs are signed by the artist and have the hanging moulded into the plate. Very good used Vintage condition, and the design is still modern looking today. Would fit in with many colour schemes and look really nice in any home. Thank you for looking. New listingLarge Nordic Studio Pottery Candle Stick Holder Vase, Huittinen Finland, Signed. Here is alarge and unique Nordic Studio Pottery Candle Holder/Vase. This studio pottery vase was made inHuittinen, Finland and are signed as the base as such. A wonderful example of Nordic Studio Pottery. If preferred, this item is also available for collection, in person, from Bolton (BL1 area). From a recent house clearance. Needs a wash up as grubby.7" high approx. Earthenware(I think). glossy brown glaze with fat lava style yellow decoration. A beautifully made studio thick glaze vase wonderfully made with tube lined decorations. Condition Report: Excellent condition- general age wears. All beautiful as shown. Date: early 20. th Century. A very attractive table centrepiece / or fruit compote bowl. Italian studio art pottery. Condition Guide. All item pictures are taken under bright white product photography lighting. Although we always try to show the products colours to the best of ability, on occasions it is possible that the colours in the picture might slightly differ from the actual. Delightful Vintage Gres D'Art Basque French Hand Painted Vase. Signed "Therisa"
On the base is a backstamp reading "Gres D'Art Basque. Grand Feu. A charming little vase which is still bright and fresh, though it probably dates from around the middle of the last century. It is hand made and hand painted with a scene of a Basque peasant sitting under a tree and drinking wine from a skin. 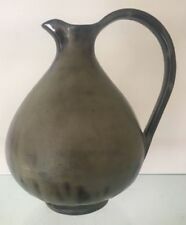 This pottery jug, was made in the Romanian town ( commune ) of Corund. Corund is famous for its pottery and ceramics. No cracks, but has a chip on glazing at base of vase ( see pic 9 ). The pottery is in very good condition for it's age, it has a bit of paint scraped off the base as shown. The gold guiding and paintwork is still bright as seen in photo's. width: 19 cm. Artisan Hand Made & Painted. Signed TS. A rare original studio ceramic from Italian ceramics designer Bortencello.highly collectable. Lovely large water pitcher / ewer with high majolica glaze and sgrafitto relief. Fully signed "Italy 8054" in excellent condition dating to the 1950s. Studio Art Ceramic Plate With Stylised Fish Design. Lovely bright colours with a very contemporary look, not sure of the maker as an adhesive plate hanger disc stating Axminster Devon is on the back. Probably from when it was made? There are a couple of marks visible outside the disc. Very 1960's feel to it! Possibly Ruscha of a smaller studio pottery. 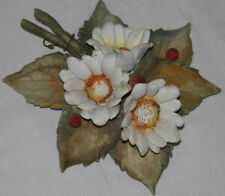 Stands approx 28cms High. West German Fat Lava Era Jug Vase unmarked. Vase weighs 2.1Kgs as is. Vintage Large 14" Safi? Moroccan Studio Pottery Vase Bee Design Beautiful. Not signed 14" tall, 8" at widest point In lovely condition Condition is Used. Dispatched with Royal Mail 2nd Class. 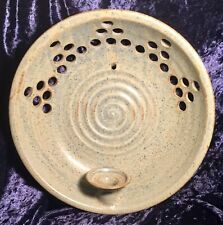 Nordic Studio Pottery Wall Candle Sconce, Huittinen Finland, Signed.